Zero hour contracts, where people do not know from one week to the next how much work they will get, or aren’t paid for time travelling between visits, have been in the media over the last week or two, mostly in relation to fast food outlets and retail companies. However, the use of these contracts in the care services in the public sector is also now coming to light. Camden Council makes regular claims to be a London Living Wage employer, yet has commissioned companies to provide services for some of the most vulnerable residents using zero hour contracts. When this has been raised with councillors, they have said “it’s the market” or not even replied. Therefore the Housing & Adult Social Care Unison stewards decided that it would be a good idea to highlight the use of zero hour contracts by one of the borough’s biggest employers. A protest against this has been called for Tuesday 13 August, 5.30pm outside Camden Town Hall, Judd St, WC1 and everyone is welcome to join it. The letter below has also been sent to the local press from Camden unison . It is with dismay that following a week where the scandal of zero hours contracts made national headlines, we have to protest at Labour-led Camden Council’s ongoing failure to commission services on the basis of decent pay and conditions for staff. Camden’s home-care services were privatised more than four years ago, and most workers are now employed on zero hours contracts. Where UNISON has raised this with Councillors and commissioning chiefs, we have been met with the refrain of “blame the market” at best and, at worst, a stony silence. Of course, Camden commissioners also cite the savage Government cuts to budgets as their excuse for letting contracts with care providers who refuse to pay the London Living Wage, though the process started before the arrival of the current Tory-led coalition. Meanwhile, a system that relies increasingly on poverty pay and job insecurity for most of its workforce is surely a recipe for ever more cruelty and neglect. In the 21st century, we are facing a race to the bottom in the pay and conditions for those who carry out demanding jobs in caring for vulnerable people in their own homes. The ‘direction of travel’ appears to be back to a Victorian future. Even in London home-care workers’ pay is often either at or barely above the National Minimum Wage (£6.32 per hour from 1 October), and staff frequently receive no pay for travel between their clients, while sick pay and holiday pay is at the bare minimum. decent occupational sick pay and holiday pay. We urge readers to write in protest at this scandal to the Leader of the Council – Sarah Hayward, Deputy Leader of the Council – Pat Callaghan (who is also lead member for Adult Social Care) and demand that Camden’s Labour Council insist on the above minimum standards for all commissioned services and demand that the Labour Party commits itself to the abolition of zero hours contracts if returned to Government at the next General Election. 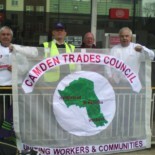 This entry was posted on August 8, 2013 by CAMDEN TRADES COUNCIL.